Bear | Stamp Right Up! 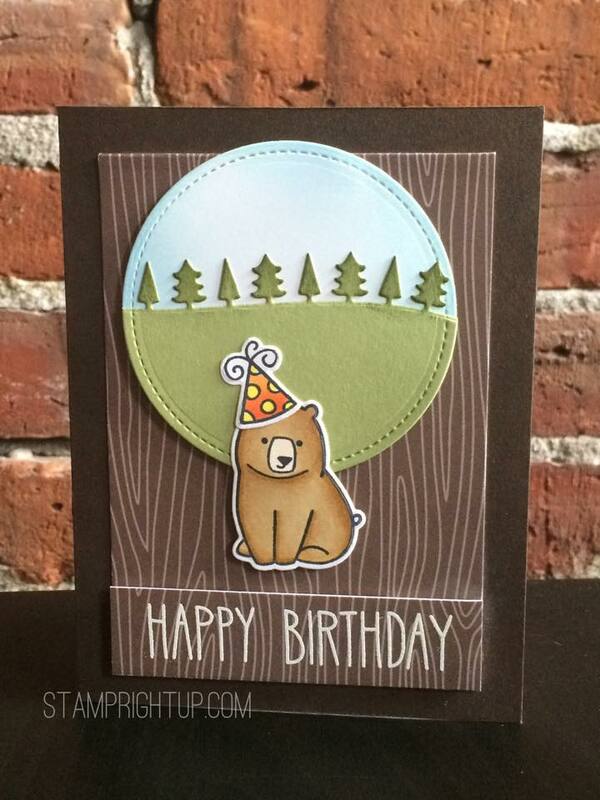 This card I made for a girl at the office who loves bears & recently had a birthday. I whipped this card up pretty quickly using the bear from the Love You Smores set. I don’t have the woodgrain backdrops stamp set so I used one of the walnut note cards as the layer underneath the die cut trees. I added a splash of color to the trees to give it some contrast, and blended in some Broken China distress ink for the sky. The bear was colored with Spectrum Noir markers Gb10, GB 8 & EB2, I stamped & die cut the hat from Hat’s Off and colored with OR1, OR2 & CT 2.